I dedicated a bit of time recently to giving my WiPs some focused attention, mostly to try and finish up a few things. I made up some quilt backs, selected options for bindings, made a few straight line quilting decisions on a smaller quilt, and also sent a couple of quilts off to be professionally quilted. First up, my 'values' quilt. This little scrappy HST block was the beginning of my 'values' quilt, inspired by Blair's quilt in Blairs 'wisecraft quilts' book. I have a bit of a love-hate reationship with HSTs, but the simple half square unit really is so versatile and can be made quickly and accurately using various methods. I used some of my favourite scraps and I really loved playing with the colour values in this soft palette, it never gets boring. I decided I'd get this sweet quilt quilted by Leeanne from quiltmekiwi . She lives up north in Whangarei, NZ where she has operated her home based machine quilting business for many years. We chose an edge to edge pattern called 'mesmerize' and I am very happy with how it's turned out.
. . . and yes, it's not a quilt until it's quilted. and so, you guessed it, I'll be busy this weekend adding the binding. What an amazing quilting design you chose. And the resulting quilt is amazing too. Reminds me of an eiderdown I had on my bed when I was a little girl. Such pretty subtle colours - hope you're keeping this quilt for your house. Gorgeous quilt, gorgeous quilting, it’s the icing on the cake!! Love the quilting design. Leeanne has too many patterns, so it's hard to choose sometimes Happy binding this weekend. I love HSTs for their versatility. And your quilt looks AMAZING! I love your post. It makes me wish I was quilting a sandwich I have sitting staring at me for a while now. But it must feel pretty good! Thanks for sharing the joy! Progress to the finish always feels good. This is looking beautiful. It's so good to finish a top, to have a useable quilt while it's new and exciting. Congratulations. They match the flowers and greenery in front of it. Oh wow, I am mesmerized by that quilt pattern. 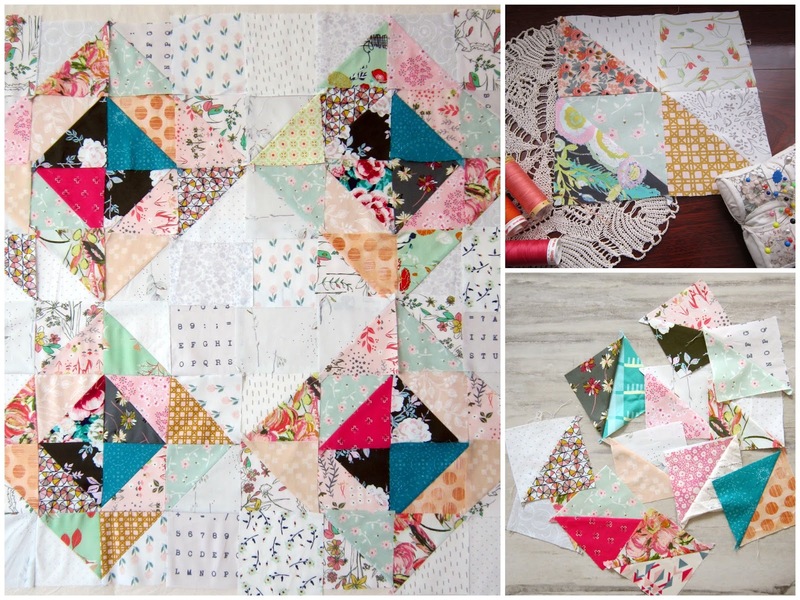 It takes your already beautiful quilt to an entirely new level. A most amazing finish! Great choice of quilting pattern. It looks lovely. Good luck finishing the binding. The quilting design compliments your beautiful quilt well, Linda - what a lovely finish.....hehe it's not finished until the label's sewn on...!!! Perfecto binding! A pleasure to work with you Linda. Wow, that is an awesome quilt! How satisfying! It’s looks so good. You really have an eye for value. All of your fabric pieces are different but they look perfect in your quilt. Your quilting is fabulous!